Our Chicken Meal & Turkey Meal recipe is advanced, grain-free nutrition for cats who deserve only the best. Sourced from trusted, passionate farmers, our premium ingredients provide all the vitamins, protein and antioxidants your cat needs to thrive. A great source of high-quality protein for your cat because it contains more protein than fresh chicken. A great source of high-quality protein for your cat because it contains more protein than fresh turkey. Chicken Meal & Turkey Meal Recipe Cat Food is rated 4.6 out of 5 by 16. Rated 5 out of 5 by Bobby 6 from A great product that my guys love! I have three males, one of which is the pickiest eater. After my usual brand changed their food by adding "moist and chewy" bits, he wouldn't touch it. Finding a new dry food that he'll eat usually involves buying several bags of expensive food, most of which he (if not all three) won't touch. My first pick, based on its ingredients, being grain free, and made here in the USA, was Supreme Source. Right from the first bowl full I offered them, all three, including the pickiest, loved it. We have found our new dry food. Can't wait to see how they like the treats! Rated 3 out of 5 by Paul2281 from Cats not liking it I feed a 40 cat feral cat colony and I had some of this food donated to me to help with feeding..I first tried feeding them this straight from the bag..They didn`t care for it,then I mixed it in with some other dry food and they picked around it..I have never seen them pick around food before. It cracked me up,lol...Wondering if I should try some canned food mixed with it.. Rated 5 out of 5 by RCCATLADY from my cats love it!!! i have been buying this product several times for my cats and i think everyone of them likes it. I am a woman in her fifties and when i open the bag and smell it, the smell reminds me when I was a little kid and gave the cat or dog their food, it was the same smell and in those days we ONLY had natural, honest food. Also my cats hardly have any "accidents" anymore so this means their stomacs can easily digest this. [ most product smell like either nothing or dried up flour ] GREAT PRODUCT !!! Rated 5 out of 5 by Nalasmama from Life saver... seriously I got my cat when she was 5 months old and we tried every single brand of cat food that is out there and she would throw them up and they gave her diarrhea then we tried yours and thank heavens it didn't make her sick! Now she has her own babies and they are just starting to eat it and they love it as well!! Thank to so much for what you do!! Rated 5 out of 5 by Chass from my Cats like it I was not able to make it to my regular cat food store so I purchased what was on the shelf looking to be healthy for cat to eat. With past brands that appeared healthy I could not get my cats to eat it. This worked, 3 inside and two feral outside all seem to enjoy it. Rated 5 out of 5 by Sherlock from My cat likes it! My cat definitely likes this cat food. I am happy that Market Basket grocery stores carry it. Easy transition from another brand. ADULT: For adult cats feed once or twice daily. May be fed dry or moistened with water. Use table above and adjust to maintain body weight. Always provide fresh clean drinking water for your cat. KITTENS: Kittens generally nibble solid foods at three to four weeks of age. 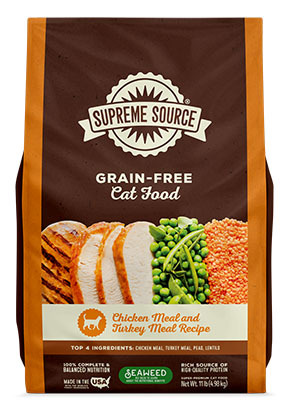 Keep moistened Supreme Source® Chicken Meal and Turkey Meal Cat Food available at all times. After weaning at six to eight weeks, kittens will normally eat dry or moistened food at will. PREGNANT OR NURSING FEMALES: Supreme Source® Chicken Meal and Turkey Meal Cat Food is a complete formula, providing extra nutrition for females in stages of gestation and lactation. Food intake may double or even quadruple during lactation. We created our grain-free recipes in order to offer an alternative for those pets with food sensitivities. In order to avoid similar digestion issues while changing your cat’s diet, it is important to allow 7-10 days to transition to Supreme Source®. 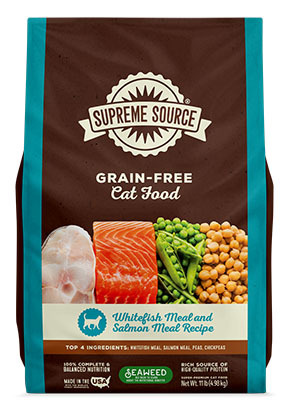 Each day during the transition, simply reduce the percentage of the current food and increase the percentage of Supreme Source® in your cat’s diet until you are feeding 100% Supreme Source®. Chicken Meal, Turkey Meal, Peas, Lentils, Faba Beans, Poultry Fat (Preserved with Mixed Tocopherols), Potato Starch, Dried Egg Product, Natural Flavor, Ground Flaxseed, Sodium Bisulfate, Salmon Oil (Preserved with Mixed Tocopherols), Organic Dried Seaweed Meal (Ascophyllum nodosum), Choline Chloride, Betaine, Calcium Carbonate, Vitamin E Supplement, Carrots, Blueberries, Cranberries, Spinach, Parsley, Pomegranates, Taurine, Zinc Proteinate, Zinc Oxide, Niacin Supplement, Ferrous Sulfate, L-Ascorbyl-2-Polyphosphate (Source of Vitamin C), Vitamin A Supplement, Manganous Oxide, Manganese Proteinate, Copper Sulfate, d-Calcium Pantothenate, Thiamine Mononitrate, Sodium Selenite, Riboflavin Supplement, Pyridoxine Hydrochloride, Copper Proteinate, Calcium Iodate, Vitamin D3 Supplement, Folic Acid, Cobalt Carbonate, Inositol, Biotin, Menadione Sodium Bisulfite Complex (Source of Vitamin K Activity), Vitamin B12 Supplement, Rosemary Extract. Supreme Source® Chicken Meal and Turkey Meal Recipe Cat Food is formulated to meet the nutritional levels established by the AAFCO cat food nutrient profiles for all life stages. Vitamin A 15,000 IU/kg Min. Vitamin D 1,500 IU/kg Min. Vitamin E 300 IU/kg Min. Omega-3 Fatty Acids 0.5% Min. CALCULATED CALORIE CONTENT (ME): 3,650 kcal/kg., 394 kcal/cup.